Panasonic has announced two new additions to its award-winning Lumix TZ-line – 9.1 megapixel DMC-TZ5 and 8.1 megapixel DMC-TZ4, featuring an 28mm wide-angle, 10X optical zoom Leica DC Vario-Elmar zoom lens with aspherical and ED (extra low dispersion) elements for improving optical quality. These newest Lumix TZ cameras also includes Advanced Intelligent Auto (iA) mode combines Panasonic’s Intelligent Exposure function, which corrects lighting differences; face detection; Intelligent ISO, which uses motion detection to track subject motion and adjust ISO and shutter speed settings accordingly; Intelligent Scene Selector, which chooses the mode that best fits the situation; as well as Quick AF continuous autofocus, helping users to get great photoshots in every situation. In addition, the company also includes the new high-performance image-processing LSI, the Venus Engine IV to Lumix TZ4 and TZ5, aiming for rendering even higher-quality images thanks to its more advanced signal processing technology. 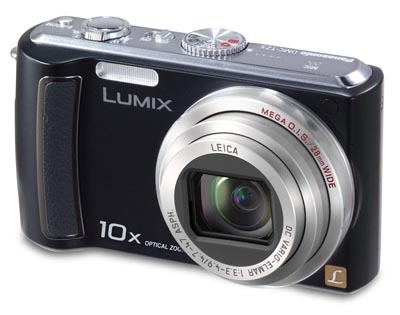 The Panasonic Lumix TZ5 (3-inch LCD) which available in blue, silver and black finishes will cost about $350, while the $300 Lumix TZ4 (2.5-inch LCD) only comes with silver and black finishes. Both of them will ship by March 2008.